You are currently browsing the tag archive for the ‘easy wet felt’ tag. 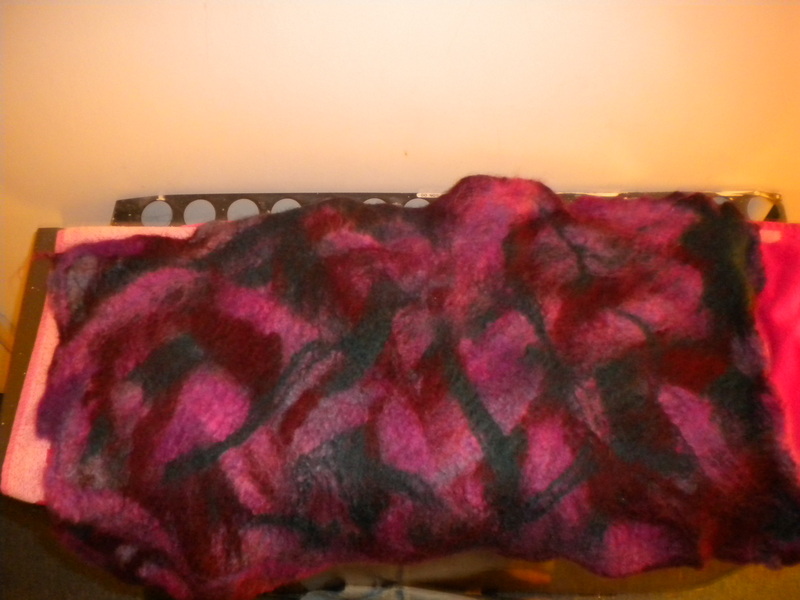 When I made the felt for lining my mum’s noro knitted bag I wasn’t very experienced and laid about 3 times too much fibre spread too thinly over too big an area, and too boot I underfulled it. I was worried and my expectations were right, it’s basically unfelted itself from daily use. I never like to do 1/2 a job so was glad to get the chance to rectify my mistakes. This is a tutorial for basic flat felt. I took a few photos of the process, and will explain the steps I forgot to photograph! Work area: Table – the highest you can find, water proof table cloth, towel(s), bubble wrap. Lay these out in the order listed, with the bubble wrap bubble side up. 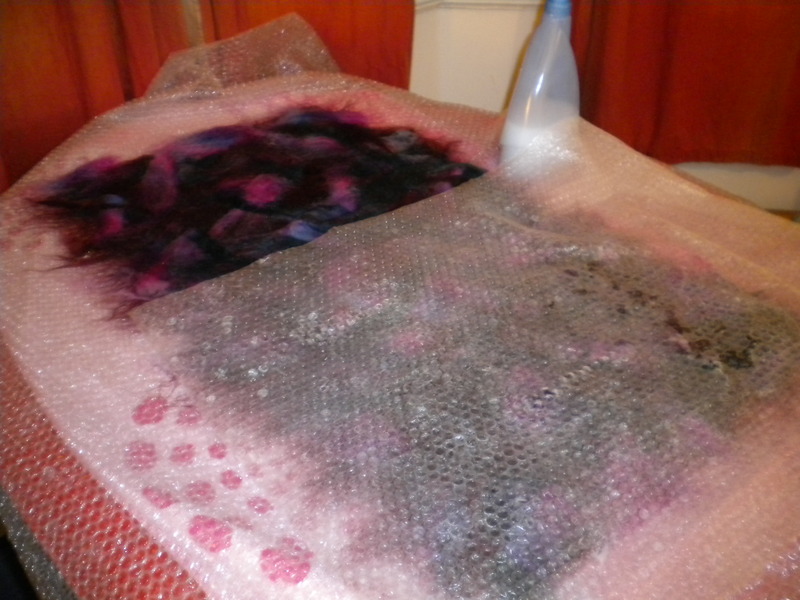 You may also want to add a second layer of bubble wrap/plastic or netting to add over the fibres when wetting. Laying fibres: I used merino and corriedale (which felts faster/more than merino in my experience) and laid 2 layers using 1 colour as a base 1/3 larger than I wanted the final fabric to be to allow for shrinking. 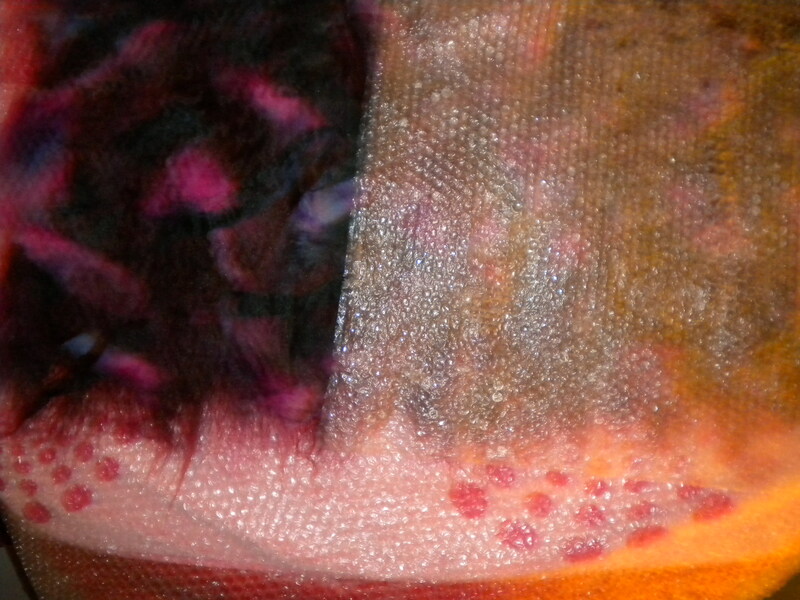 I then added the coloured fibres in 3 seperate layers. I tried to lay these 3 layers out to ensure there were roughly equal amounts of fibres laid in all different directions to help the felt shrink as evenly as possible. If this is your first attempt I’d recommend laying an area about a 1/6 of the size of mine until you’ve got a feel for it. Be mindful that it is best to lay only very wispy amounts and build up each layer gradually to help the fibres entangle and essentially felt into a better fabric. If you lay out big wadges of fibre they will not felt together easily and it will take a very long time to create anything useful! I laid areas of decoration on the top layers with big blocks of colour. Try to build these up rather than use one bigger amount of fibre again – it will save you time on the next, more time consuming, steps. Next I grated some soap (olive oil is often the feltmakers choice but I prefer ‘normal’ hand soap for some reason unknown to me…all I do know is that it has more suds) into some very hot water in the spray bottle. I added the soap to the water instead of the other way around to prevent too many suds at this stage. I then sprayed the fibres with with the nozzle set to a very fine mist, because I had no netting protecting the fibres from moving about. If you use netting you can dribble it a bit more liberally – if doing it my way be patient, it can take a while to get it fully wetted. Make sure the fibres are all wet and ‘stuck together’ but there should be no pools of water. You can use a second layer of bubble wrap, bubble side down and gently rub your hand all over to spread the water evenly through the fibres. It helps if you spray this as your hands can glide over it. The photo above shows the felt starting to come together. By now if needed I have added more soap by rubbing the bar over the felt if it is covered in netting, or if not by covering my hands liberally in soap and rubbing and patting it into the felt, being mindful of the still fragile fibres. Then, whether using netting or bubble wrap to cover the felt, glide your hands all over the felt ‘sandwich’ using an even pressure. This will start the fibres entagling. Continue doing this until you can do the pinch test: can you pinch up a small amount of fibres to create a ‘tent’ effect that does not fall apart and feels and looks like a skin has been formed. It will look very different to the fibres when they had only been wetted out. If your felt is cold now, as mine usually is, it’s a good idea to fold it up very gently (it is still fragile) and take it to a sink. Squeeze out the excess water and fill the sink with water as hot as you can stand. Place your prefelt (as your creation is known at this stage as it can be cut up and added into felt designs) into the water and saturate it. Then lift it gently and gently press out 95% of the water. Take the package back to your workstation, CAREFULLY unfold and re wet/soap with hot water if needed. You want the fibres to be wet and soapy still but not sopping. Next, replace the top layer (bubble wrap bubble side down or netting) and roll the whole bundle up into a sausage evenly. I roll the bubble wrap (& net if using) into a sausage first then roll the towel around that as I find it slips less. It is also a good idea to tie the bundle twice at 1/3 intervals to prevent slipping. Now, take the bundle and start rolling, using your hands first and moving to using your whole forearms. Roll this 100 times. If using netting stop and unroll the sausage, and lift the net gently every 50 rolls or so to ensure the fibres aren’t felting to it!). After 100 rolls unroll the sausage and turn the felt 90 degrees. Roll back up and roll 100 times. Unroll, turn felt over and turn 90 degrees roll up and roll 100 more times, unroll again, turn 90 degrees and roll 100 times. 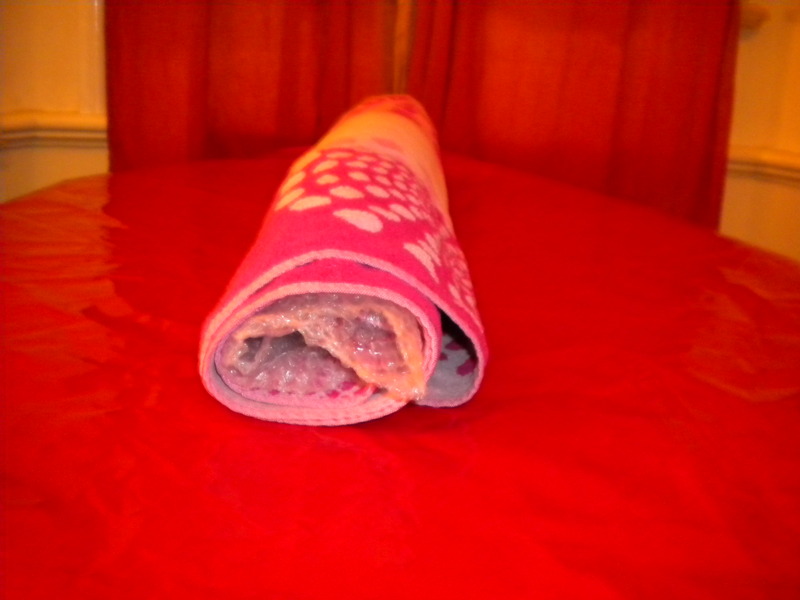 Now unroll and inspect your felt more closely. You should pay attention to how much the felt is shrinking and how it seems to be a lot stronger/more entangled whilst you are rolling but now is the time to really inspect it. Has it shrink evenly? Are all the areas strong and well held together? Has it shrunk enough? Is it an even thickness? Is it thicker or thinner than you wanted? Pay attention to how your design and the nature of the fabric has changed with the process – this is the best way to learn how much fibre to use, how many layers to make, what fibre to use and how to lay your design out to achieve the best effects. If your felt does not feel strong repeat the ‘reheating’ process and resoap, and reroll the parcel again until it is. If it does not feel strong at this stage you either laid your felt too thinly or unevenly or it simply hasn’t been felted enough – if it is the former keep it! You WILL find ways in the future to incorporate it into some exciting projects. 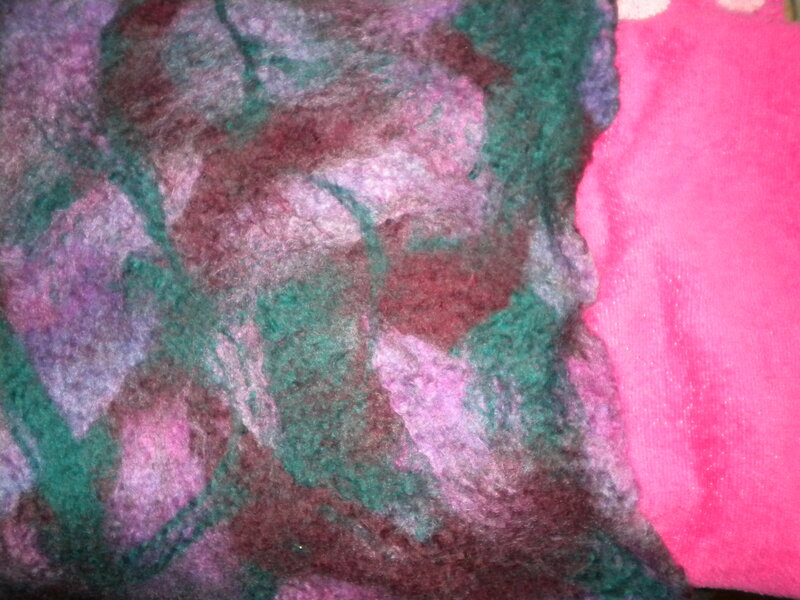 If any areas are not felted as well as others, spot full them. You may want to reheat it by immersing in hot water, you can be less gentle now and run it under the tap if you like. Resoap the area in question and rub with scrunched up bubble wrap, or against a washboard if you’re lucky enough to have one. Rub until the area seems as felted as you desire. If your felt is strong, start gently pulling and stretching it. It seems counter-intuitive but helps the fibres to entangle more and the scales on them to lock together thus making it even stronger and more robust. 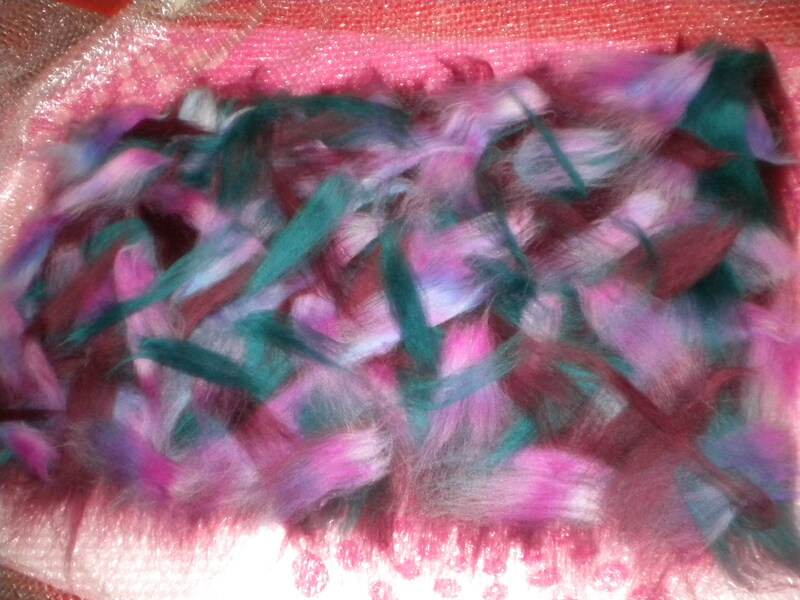 It is also a good idea to throw your felt – you may want to reheat it by immersing in hot water, you can be less gentle now and run it under the tap if you like – and then gather up your felt randomly and throwing, hard, into the bath or onto your bubble wrap – it will get wet at this stage but it really helps the felt! Repeat all of the above a few times and then stretch into shape a final time. Run under the hot and cold taps alternately, pressing out excess water between temperature changes. Do this 3 times or until all the soap is completely removed. Pull into desired shape and leave flat to dry (I put mine on top of a towel on my radiator). I hope it that the process is more clear with pictures, although as I’ve said before I’ve made a vow to take more pictures of all stages of the process so I can be more visual and less wordy when explaining what I’m doing.